Since my oven works now, I made muffins for breakfast. They are so good! In large mixing bowl, combine KELLOGG'S ALL-BRAN cereal and milk. Let stand about 2 minutes or until cereal softens. Add egg and oil. Beat well. Add flour mixture, stirring only until combined. Portion evenly into twelve 2 1/2-inch muffin pan cups coated with cooking spray. 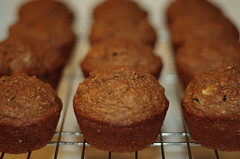 I used part brown sugar and 1/4 cup whole wheat flour in my muffins.